Neither humans nor A.I. has proven overwhelmingly successful at maintaining cybersecurity on their own, so why not see what happens when you combine the two? That's exactly the premise of a new project from MIT, and it's achieved some impressive results. 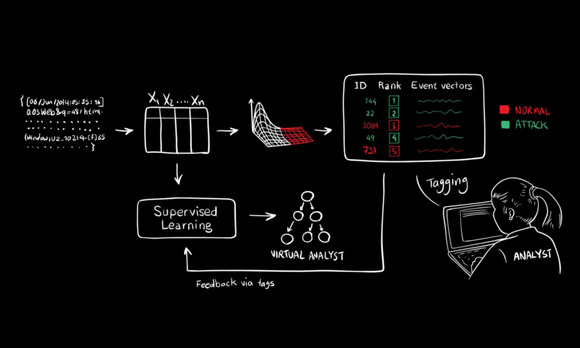 Researchers from MIT’s Computer Science and Artificial Intelligence Laboratory (CSAIL) and machine-learning startup PatternEx have developed a new platform called A.I.2 that can detect 85 percent of attacks. It also reduces the number of "false positives" -- nonthreats mistakenly identified as threats -- by a factor of five, the researchers said. "You can think about the system as a virtual analyst," said CSAIL research scientist Kalyan Veeramachaneni, who developed A.I.2 with Ignacio Arnaldo, a chief data scientist at PatternEx and a former CSAIL postdoc. "It continuously generates new models that it can refine in as little as a few hours, meaning it can improve its detection rates significantly and rapidly." Even as fears abound regarding the job-replacing potential of artificial intelligence, it's becoming increasingly apparent that combining A.I. with human insight can deliver much better results than either side could produce alone. Just last week, for example, Spare5 released a new platform that applies a combination of human insight and machine learning to help companies make sense of unstructured data. Experts, meanwhile, tend to be short on time. Recognizing that constraint, A.I.2 uses machine learning first to find the most important potential problems; only then does it show the top events to analysts for labeling. On day one of its training, A.I.2 picks the 200 "most abnormal" events using unsupervised machine learning and gives them to the human expert, MIT explained. Those analysts then confirm which events are actual attacks, and the system incorporates that feedback into its models for the next set of data.